A Democratic primary race in northern New Jersey has devolved into a highly competitive proxy war over Israel, pitting the state's pro-Israel community against a growing constituency of Arab voters who have accused a sitting congressman of putting Israel's interests before America's. "One side says, 'We want this Jew out of office' and, frankly, it's pretty unsettling," Ben Chouake, president of NORPAC, a pro-Israel political action committee based in Englewood Cliffs, told the Free Beacon. "They emphasized [Rothman] is a Jewish congressman." Others say they simply cannot recall a congressional race becoming a referendum on a candidate's religion. "For the first time in recent American political history, we are witnessing a proxy battle between supporters and detractors of Israel, and it's playing out in the Ninth District of New Jersey," said one veteran campaign strategist who is knowledgeable about the district. 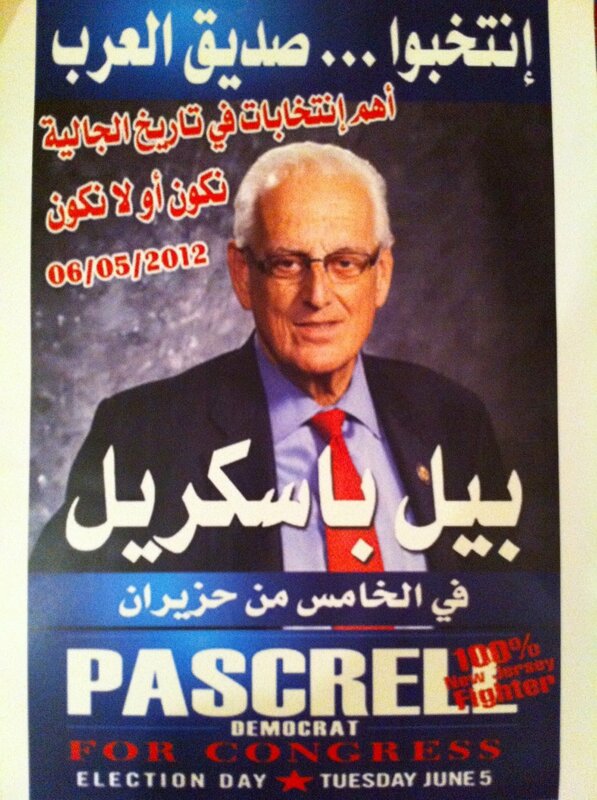 The race took an unprecedented turn on Monday when an Arabic campaign poster supporting Pascrell surfaced. It urged the "Arab diaspora community" to "elect the friend of the Arabs" and billed the race as "the most important election in the history of the [Arab] community," according to a WFB translation of the sign. "I don't read Arabic well, but I am pretty sure that the pro-Pascrell posters that have appeared across the district are not calling to elect the candidate who supports a strong relationship between America and the only democracy in the Middle East, one which is rooted in progressive Western values—women's rights, gay rights, tolerance, freedom of speech, freedom of religion, etc.," said Josh Block, a Democratic strategist and former spokesman for the American Israel Public Affairs Committee. Observers such as Susan Rosenbluth, publisher of the New Jersey-based Jewish Voice and Opinion, say the race took an anti-Semitic turn in late February, when a prominent Arab supporter of Pascrell accused the state's Jewish voters of being more loyal to Israel than America. "Unquestionably, this primary election is pitting two otherwise harmoniously coexisting communities: the Muslim and Jewish communities," Aref Assaf, president of the New Jersey-based American Arab Forum, wrote in a New Jersey Star-Ledger column headlined "Rothman is Israel's man in District 9." "As total and blind support for Israel becomes the only reason for choosing Rothman, voters who do not view the elections in this prism will need to take notice. Loyalty to a foreign flag is not loyalty to America's," Assaf wrote. The canard—reminiscent of the "Israel firster" controversy that has engulfed the left-wing Center for American Progress Action Fund and Media Matters for America—reverberated through the tight-knit Jewish community, raising alarm among pro-Israel stalwarts. "A number of Arab-American constituents have come out with outrageous attacks on Rothman," said Rosenbluth, whose newspaper is based in Englewood. "I haven't heard a dual loyalty charge for years." At that point, things really "started to get ugly," said NORPAC's Chouake, explaining that "for the pro-Israel community, it's not about Jewish or not-Jewish or helping an ethnic culture, but about believing there should be a homeland for a people oppressed and slaughtered for 2,000 years." "It's a little bit scary," said Chouake, who noted that massive voter registration drives in the Arab community have added at least 6,000 new names to the rolls. Some of those registrations have been disputed. Most disturbing, said Rosenbluth and others, is that Pascrell has remained silent, refusing to condemn the charges of dual loyalty. "I called Pascrell's office and asked, 'Will you condemn it?' " Rosenbluth said. "They said, 'We didn't write it.'" As Election Day approaches in the tight race, Assaf again has taken to the pages of the New Jersey Star-Ledger to rally the Arab community. "The more we vote this year, the more important our community will be in future elections," Assaf wrote Wednesday. "In New Jersey's Ninth District race between Pascrell and Rothman, our vote will be of pivotal significance to the outcome." In a separate column released Monday, Assaf referred to the city of Paterson a "Little Jerusalem," and deemed "the root of the conflict" in the race as lying "thousands of miles from Paterson, in the heart of the Middle East." Assaf went on to make several unfounded claims about what he said is Rothman's "misdirected commitment" to Israel. "The Arab and Muslim community of northern New Jersey is taking notice of how Steve Rothman is using his support of Israel as the centerpiece of his campaign," Assaf wrote in the op-ed, which included a picture of the pro-Pascrell Arabic campaign poster. "They take issue with Rothman bragging about his help in getting Israel over $50 billion in aid since 2001, while bringing back only $2 billion to New Jersey residents." Rothman has consciously avoided adding fuel to the ethnic fire by focusing instead on his congressional record, note political observers in both New Jersey and Washington, D.C.
"Rep. Rothman has run an issue-oriented campaign, focused on progressive values domestically and abroad, including his strong pro-Israel credentials, among other things," said Block. "Rep. Pascrell, however, has implicitly endorsed odious attacks on Rothman's religion and commitment to the United States. These claims are reminiscent of canards regularly bandied about by White Supremacists and anti-Semites." Pascrell is clearly "seeking the support of Muslim and Arab voters at the cost of his Jewish support," one political operative in New Jersey said. Meanwhile, the district's typically Republican Orthodox Jewish voters have mobilized behind Rothman. In February, Orthodox leaders from 15 synagogues in Passaic urged their congregants to switch party affiliation so that they would be eligible to vote for Rothman in the primary. "This is very important to the Orthodox community, and Rothman's relationship with the Orthodox community is strong," said Rosenbluth. "Pascrell's has been tenuous." That has led Pascrell to embrace a growing community of Turks, Palestinians, Lebanese, Syrians, and Jordanians—many of whom were moved into the Ninth District last year when congressional maps were updated in response to the census. Pascrell in recent weeks has waged a charm offensive in the Arab community, campaigning alongside a Hamas-sympathizer and many who have expressed hostility towards Israel. James Zogby, president of the American Arab Institute, recently helped Pascrell collect more than $50,000; Zogby is a longtime critic of Israel who has accused the U.S. of "being the coat holder and cheerleader" for the Jewish state. Pascrell also has embraced Imam Mohammad Qatanani, a controversial Passaic spiritual leader who stands accused by the State Department of hiding a conviction in Israel for having ties to the terror group Hamas. Last Friday, Pascrell held a high profile event at a local mosque where he was joined by Rep. Keith Ellison (D., Minn), a prominent ally of the fringe group J Street and the first Muslim member of Congress. Pascrell, too, has come under fire for his association with J Street. In 2010, the lawmaker endorsed the so-called "Gaza 54" letter, which demanded that President Obama force Israel to end its "collective punishment" of those living in the Gaza Strip. It is a vote that Pascrell has said he "doesn't regret." "By campaigning so hard with one group, were Congressman Pascrell to win reelection, it seems that his marginally supportive voting record on Israel may take a turn for the worst and become openly hostile," said the New Jersey-based political operative. Others are worried that the pro-Israel and Jewish community will suffer if Pascrell is victorious. "If Pascrell gets in, I'm very worried and concerned because he's broken many bridges with the Jewish community," said Rosenbluth. "I resent him turning his back in such a blatant way on the Jewish community."